Patient co-payments are expected at the time of the appointment. If a patient is not aware of his or her co-pay amount, the average co-pay of $25 will be collected at the time of service. If adjustments are to be made, the company will do so proptly after the Explanation of Benefits is received from the third party payer. Although we are billing your insurance companies as a courtesy to you, you are responsible for your account. If the insurance information you provide us is incorrect, you will be responsible to pay your account in full within 30 days, you may then bill your insurance company yourself to obtain reimbursement. All accounts are to be paid off in full within 30 days unless prior payment arrangements have been established in writing. If the problem for which you are seeing the physician involves litigation, such as may result from an automobile or work-related accident, be advised that payment is expected whether or not litigation is settled. Your signature authorizes us to contact references in the event it becomes necessary to locate you. Past due accounts are required to pay cash in full at the time of service. All credit balances may be held as credits against future services rendered, unless credit refunds are requested in writing by the patient and patient care has been deemed complete by the physician. A one-time processing charge of $25 and a 9% APR interest may be imposed on all accounts 60 days past due. A $25 fee will be charged on all checks returned to the bank for lack of funds and are subject to Oregon Law, ORS 30.700, which states legal action can be taken for three (3) times the amount of the check or $100, whichever is greater. In the event you do not give at least a 24 hour notice prior to canceling an appointment and/or if you do not show for a scheduled appointment or procedure, there will be a $25 administrative scheduling fee assessed. Dr. Andrew Bower’s charges and fees are separate from St. Anthony Hospital’s or other provider’s charges and fees. Financial Aid agreed to by St. Anthony Hospital or other providers does not apply to our office, or to Dr. Andrew Bower’s charges. Patient portion of charges are determined by your individual insurance policy. The patient responsibility portion of charges must be collected by our office per a legally binding contract that Dr. Andrew Bower holds with your insurance company. This contract allows us to be a “Preferred Provider” and/or “Participating Provider”. Your deductible, co-payment and/or co-insurance are all determined by your insurance company. If you have any questions or concerns regarding these items, please contact your insurance company. You are encouraged to contact the Clinic Administrator if you have any questions regarding your account or if you do not fully understand these policies. In an effort to provide payment options for our patients, the Northeast Oregon Surgical Clinic, LLC accepts the following forms of payment. Patient balances are due in full upon receipt of their statement. If you are unable to pay the balance in full by cash, check, or credit card, an annual interest rate of 9% will be assessed to all accounts with a balance 60-days or more past due. * Company Sponsored Payment Plans: One option provided to patients is the company sponsored payment plan. 50% of anticipated procedure and office visit charges are due prior to the procedure date. The remaining 50% of the charges can be paid in 12, 24 or 36 monthly installments at an annual interest rate of 12% to 22% (determined by your credit application and length of loan), plus a processing fee of $50.00. If a monthly payment is not made within 10 days of the due date, your account will be sent to a collection agency. If your procedure and office visits have already taken place, you may still take advantage of the company sponsored payment plan. A credit applicaiton must be completed and submitted for review, you will then be contacted to review the terms of your loan. A signed loan agreement must be on file. Loans are available for 12, 24 or 36 monthly installments at an annual interest rate of 12% to 22% (determined by your credit application and length of loan), plus a processing fee of $50.00.If a monthly payment is not made within 10 days of the due date, your account will be sent to a collection agency. 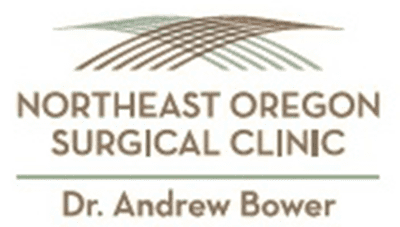 Dr. Andrew Bower and the Northeast Oregon Surgical Clinic are happy to offer care to Cash Pay Patients, otherwise known as patients who do not have insurance coverage and must pay for such expenses out of their own pocket. Cash Pay Patients are required to pay $175.00 at the time of service for office visits regarding new issues. Follow up appointments (for the same issue) are $75.00 each and must be paid in full at the time of service. When you check in, please indicate that you are a Cash Pay Patient and pay the appropriate sum in full. If you cannot pay the appointent fee in full upon your arrival, your appointment will gladly be rescheduled for a later date. If Dr. Bower has recommended you undergo a surgery or procedure, payment arrangements must be made prior to being scheduled. Along with accepting Cash, Check, Debit Card, Visa, Mastercard, American Express and Discover cards, our office is proud to offer a payment plan option for our Cash Pay Patients. Company Sponsored Payment Plans: An option for cash pay patients is the company sponsored payment plan. 50% of anticipated procedure and office visit charges are due prior to the procedure date. The remaining 50% of the charges can be paid in 12, 24 or 36 monthly installments at an annual interest rate of 12% to 22% (determined by your credit application and length of loan), plus a processing fee of $50.00. If a payment is not made within 10 days of the due date, your account will be sent to a collection agency.